In 1937, 34-year-old Harry Bingham IV, a career Foreign Service Officer, was sent to France to assume his duties as Vice Consul in Marseilles. His job was to issue visas for those seeking to enter the United States. A routine job would soon become anything but. Within three years, the world was at war. In June 1940, the French government surrendered to Adolf Hitler’s forces. In Article 19 of the armistice, France agreed to “surrender on demand all Germans named by the German government in France.” This launched a roundup of German and Jewish refugees, who were to be sent to Nazi concentration camps. Most of them would eventually die there. The American government, which wanted to limit immigration and also maintain good relations with the new Vichy government in France, refused most requests to issue visas to refugees. Daily, Harry looked out his office window to see hundreds lined up outside the consulate, pleading for help. On his own authority, he began issuing what would eventually total more than 2,000 travel visas and fake passports. He did some of this work in collaboration with an American, Varian Fry, sent to Europe by a group called the Emergency Rescue Committee. Its mission was to save Jewish artists and intellectuals. Together Harry and Varian Fry rescued people such as the painter Marc Chagall and political theorist Hannah Arendt. But Harry Bingham also saved hundreds of other individuals and families not because they were famous but because they were human beings persecuted by an evil regime. In one noted case, he helped Lion Feuchtwanger, an anti-Nazi writer, escape from the French concentration camp at Nimes, disguising him in women’s clothing. He then hid Feuchtwanger in his own villa, creating a 20th century version of the Underground Railroad. In May 1941, after complaints from German and French officials, Bingham was pulled from his post and transferred to Lisbon, Portugal. From there he was soon sent to Argentina. By 1944 he was reporting to the State Department on the Argentine practice of giving safe harbor to Nazi war criminals. He urged the U.S. government to send military personnel to ferret out these fascists, but his pleas were ignored. Also ignored, perhaps due to the thorn in their side that Harry had become, was any opportunity for promotion. Frustrated, his career stalled, Bingham resigned in protest in 1945. After leaving government service, Harry Bingham never talked about his work in Marseilles. He died in 1988. His 11 children were unaware of his heroism. It was only after his death that his sixth child, Robert, began to uncover the story, alerted to it by a posthumous invitation his father received to a 1993 “Tribute to Rescuers” organized by the U.S. Holocaust Museum. Harry Bingham’s actions drew praise at the time from those he helped. Yet, they would not earn acclaim in the United States until more than six decades after his efforts began. On June 27, 2002, Secretary of State Colin Powell presented a “courageous diplomat” award posthumously to his children. 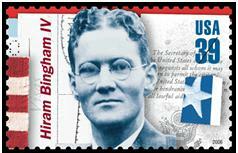 His son’s effort to bring his story to light also included a campaign to honor Bingham on a U.S. stamp, which was issued in 2006. In 1940, Harry Bingham could have chosen three paths other than the one he did. He could have followed orders, denying visas but remaining loyal to his superiors and the chain of command. He could have become a whistleblower, alerting the U.S. press to the situation he faced and the failure of his government to save refugees. He could also have resigned right then in protest. It is likely that the first course of action would have advanced his career – and just as likely that the second would have ended it, as would have the third. But with all three paths, he would have consigned thousands to their deaths. That was a road he could not take. Confronted with a conflict between his morality and his government’s orders, he crafted another approach – one that was faithful to his Oath of Office and to himself. At the State Department ceremony honoring Bingham, Ambassador Thomas Pickering praised him for his “creative integrity.” That is an apt description not just of Harry Bingham but of a public service orientation that should mark the career of every civil servant. Harry Bingham IV was definitely a national hero and extremely brave civil servant. It makes me sick to see so many innocent people killed by Hitler and the US and others did little to counteract the problem until the very end. Nice article. You might enjoy my book THE ETHICS OF DISSENT (CQ Press 2014) which includes similar stories and analyses (e.g. Japanese diplomat Chiune Sugihara).